Just lately I've recognised a need for lace in my life and my day to day life. A few years ago I'd have scoffed at the idea, but back then I enjoyed summers in multiple layers of linen, cotton, silk and woollen semi historical costume which was great in terms of insulating against the summer sun. These days I go out in the modern equivalent of a single full length skirt with one shirt and I wilt in the tiniest bit of heat. What is worse, I've rediscovered the joy of potential sunburn. This summer is the first with M where I've ventured out without a sling (which can double as a cover up) and I've resorted to wrapping a woven cashmere shawl around my neck and shoulders to keep the sun off. It looks garish and unorthodox but it works. I'm snug under my shawl but I'm not burnt and the layers work to provide a little much needed insulation. 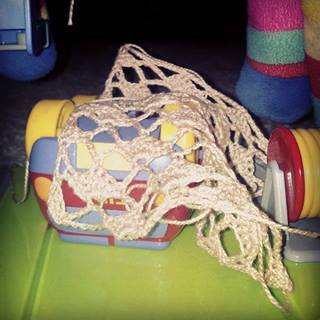 The shawl has been such a success that I've been wondering if I should add suitable lace shawls to my summer wardrobe. Of course this means I immediately decided I should make myself one. I do have a knitted WIP shawl sitting around somewhere but that required me to concentrate a LOT. Dave speaking was enough to distract me and the cobweb weight yarn was just so very slippery. 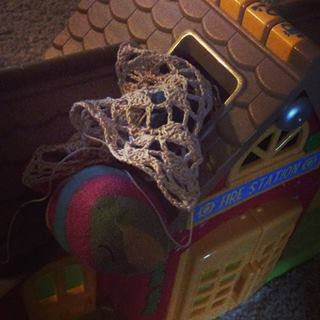 Somehow I think knitted lace that delicate would be asking for stress right now. 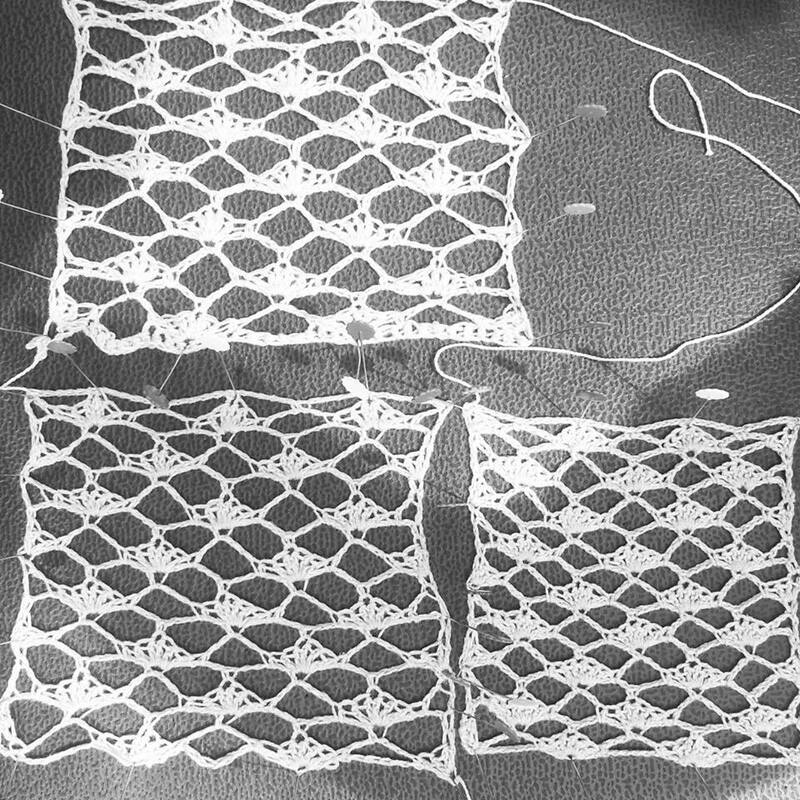 So it was that I decided to start with very simple crochet lace. Initially I thought I'd just do some trellis work then later add a fancy border, but I feared boredom would be fatal and so I decided to add a shell. 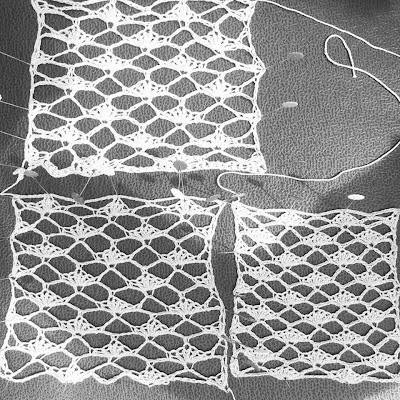 The stitch pattern is taken from the Harmony Guide - Basic Crochet Stitches, worked in a size 10 thread in 3mm, 2.5mm and 2mm hook. The thread is a cotton called Clea (Ravelry link) from my stash, left over from the humungous doily and gentleman's sleeping hat. I have over 1200m of this in white sitting in my stash and Clea is a soft thread suitable for clothing, so I'm hoping it would make a nice summer shawl. I just need to decide which hook gives the best effect. M has decided to help with the decision and has informed me she likes all three swatches. M got to work immediately testing the swatches for comfort and drape. I'm currently leaning towards the 2mm for stitch definition, but I'm still mulling over the decision.